Homemaking and lifestyle tips from the budget expert. When you hear the word deworming or PURGA, what is the first thing that comes into your mind? Honestly, mine would be poor hygiene. Yung tipong hindi naliligo araw-araw at madudungis na bata, ganyang level of poor hygiene. Pero I remembered when I was young, may lumabas na bulate sa akin. And I know I don’t have poor hygiene, takot ko lang sa lola ko kung hindi ako maligo. So it seems like, hindi lang poor hygiene ang source of intestine worms. And I discovered some more Deworming Myths and Facts. MYTH: Worms can only be obtained with having poor hygiene. Akala ng iba katulad ko, sa poor hygiene lang nakukuha ang worms. It is a misconception because worms are everywhere. It can contaminate your home and public areas like schools and playgrounds. Contaminated water is also one of the sources of worms, as well as raw or uncooked food. And it can be easily passed around! Ang worms ay napapapass-on. MYTH: You can deworm without doctor’s advice. NO, you cannot deworm without asking advice from your doctor. You need a doctor to asses the child if they need deworming. The doctor will asses the child based on their physical look, their weight and your concerns. Some kids show clear signs that they need deworming but some don’t. Ask your pedia about deworming if it is something that you should worry about. FACT: ADULTS need deworming too. Yes, not only kids need it. Worms are very common to kids but it does not mean that adults don’t have it too. What are the signs of worms in stomach? Weight loss is the number one symptoms of worms in stomach. If you suspect worms in your kids’ stomach, ask your pedia too if you need to deworm. Given that worms can be easily passed, it can be that you’re the source of your kids’ worms. Most people are afraid of deworming because of the fear of worms coming out wrong. Fact is, each deworming meds is different. That’s where you need to take extra precautions. Look for a dewormer that will prevent it from happening. Antiox works by preventing worms from absorbing sugars which they need to survive. This action causes the worms to die. After treatment of Mebendazole (Antiox), worms will not migrate to other parts of the body. MYTH: There is no danger kung hindi mag deworm. Worms can rob the health of our family. It is not true na walang danger kung hindi mag deworm ang mga bata or mga adults. What are the dangers or risk kung hindi ma purga ang bata? It can stunt their growth and it can affect their mental performance. A child with worms are always sick and with compromised immune system. Kawawa talaga ang bata kase magiging sakitin na nga, hindi pa nila ma aabsorb ng maayos ang mga nutrients sa mga kinakain nila. For adults naman, it can affect your daily activity kase feeling mo lagi kang pagod. It also compromises your immune system kase you’re nutrients absorption is greatly affected. And of course, you can easily pass it on to your kids. Pinaka nakaka shookt yan! And with these health risks and dangers that worms can bring to ur family, Antiox champions deworming for families. Unlike other deworming treatments, Antiox is a brand that is not only for kids, but is intended for every member of the family. As a mom, it is our responsibility to make sure that our family is healthy. And I know how we all strive hard to give the best protection to our family. Antiox knows that and is one with us in making sure that our family is totally healthy. Together, let’s make every Filipino home a worm-free family. With Antiox, a worm-free family means a worm-free community. Nowadays, even though automatic washing machine are everywhere and quite affordable, some people still prefers hand washing their clothes. Hand washing your clothes can be a great advantage specially for expensive clothes. It is also advisable to hand wash your underwear and brassieres. Baby clothes usually lasts longer if it is hand-washed. There are many advantages of hand washing and most of these is for the benefits of the clothes. The only disadvantage most people see is how it can damage the hand specially if the laundry soap used is very strong. It all boils down to the kind or brand of soap that you should use to ensure that your clothes and your hand is well taken care of. A group of moms recommends this 3 brands of soaps that are friendly to the hands is OK to use even though the washer have sensitive skin. Perla photo from Perla’s Facebook Page. Perla’s main component is coconut oil and it leaves the skin well moisturized that is why it is OK to use even for sensitive skin. Champion Bar. No wonder this soap has been around for long since it really is an effective and safe laundry soap. Moms testify that Champion bar is ok to use even though you have sensitive skin and it won’t damage your hands. Although not as effective as Perla when it comes to leaving the hands moisturized, Champion bar is easier to rinse on clothes. Cyles is one of the laundry soap mentioned. Cycles is a brand specially made for baby clothes. It’s surprising that this brand is very mild and OK to use for sensitive skin. The real intention of the brand is as a laundry soap for sensitive skin. Other brands that are intended for baby clothes and is very mild are Tiny Buds, and Smart Steps. A mom from our Facebook support group asked where’s the best place to shop for Noche Buena and Media Noche and most moms answered SHOPWISE. Kahit naman ako, sagot ko din Shopwise. We have been doing our Noche Buena and Media Noche shopping sa Shopwise ever since the world begun. Even though the nearest Shopwise is in Quezon City pa, it has to be Shopwise. Why? All I need for Christmas (and New Year) celebration nasa Shopwise. 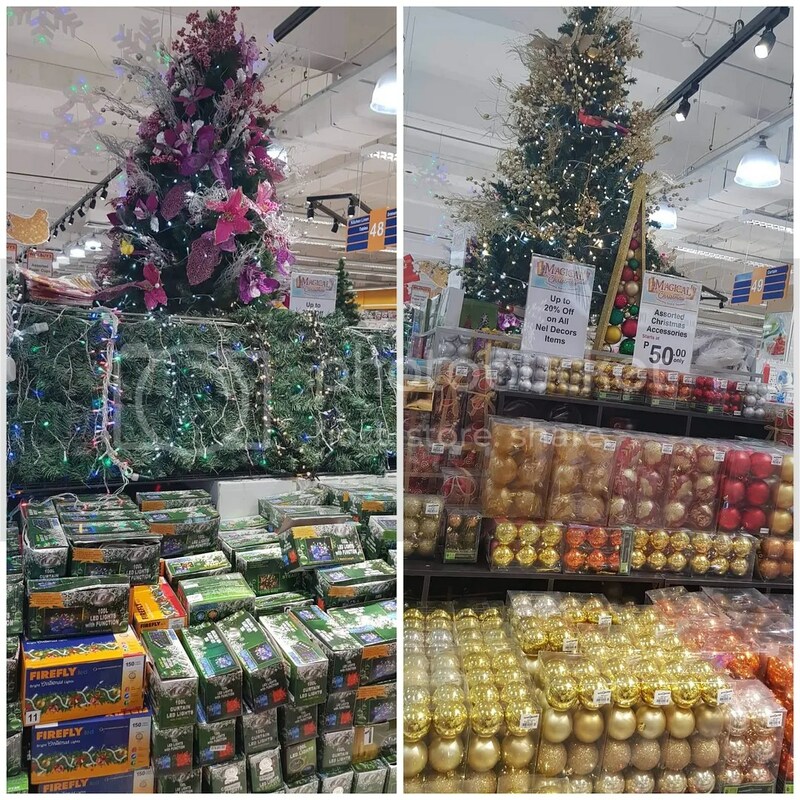 From my handa to Christmas decors and some last minute Christmas gift shopping. And I am speaking from years of expereince of shopping at Shopwise a few days before the celebrations. First Christmas sa sarili naming bahay. Syempre I want it to be as grand or as memorable as possible. We need some new Christmas decors, some new plates and the likes pero short naman sa budget kase kalilipat nga lang. Shopwise was the answer to my dilemma. Mura kase ang Christmas decors sa Shopwise and aside from the usual decors, I was also able to buy plates, glass and table runner for Christmas. For New Year, to complete our Media Noche fruit baskets, we always check first the fruit section in Shopwise. I can’t remember a year that we were not able to complete the 13 fruits needed for Media Noche fruit basket since Shopwise have all the fruits, round fruits, we need. There was a time that we decided to have wine and cheese platter for Christmas because we noticed how big the wine and cheese selection at Shopwise. We have no wine brand preference for now so wala akong ma i sa suggest sa inyo. Pero what I can tell you is sa Shopwise, you can find the cheap wines and expensive ones. Marami kang choices. Same goes when it comes to cheese, you can buy per 100 grams. Las Christmas naman, we invited my brother in law’s family to spend Noche Buena with us. We already have a gift for their baby girl which we brought at their house already.. but since they will be spending Christmas with us, we decided to buy her another one. Shopwise never failed me when it comes to this area of adulting. They always have something na pwedeng ipang regalo. From toys to small house appliances, clothes and even gadgets like charger and ear phones. And of course their wide assortment of Christmas basket that caters to our budget. They have affordable assortments and there are expensive ones din. The best part for me is the wide range of meat that is available sa Shopwise. We can always have the steak that my kids look forward to, or the BBQ that my ate wants. Or the chicken for our macaroni salad. And speaking of, I love how Shopwise highlights ang mga pambansang panghanda like Macaroni salad and fruit salad. Holiday Ham never runs out of supply sa Shopwise. That’s our favorite Christmas ham, sarap kase and very real ang lasa. Wide variety, wide assortment, wide selection, tingnan nyo, parehas kame ng description ni Mariel ng Shopwise. We’re planning to do our shopping this weekend for our Noche Buena, how about you momshie? are you done with your Noche Buena shopping? Kailan kayo mamimili sa Shopwise?